The Accent line of speech-generating devices offers user-friendly features to make communicating fast and easy for individuals with speech impairments. In addition, available vocabulary options feature the Unity® family of language systems including LAMP Words for Life®, the UNIDAD® and LAMP Words for Life® – Spanish/English language systems for Spanish/English bilingual use and CoreScanner™. Other vocabulary options include Essence® for literate adults and WordPower™. The Accent 1400 features an outstanding battery life and large, 14” screen, making it the perfect choice for individuals with complex access needs or for those who want larger icons. The Accent 1400 also offers multiple access options and accommodates the NuEye® Tracking System and the NuPoint® Head-tracking System. 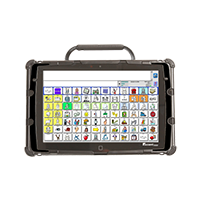 With its portability and bright 10.1" display, Accent 1000 is easy to access and provides numerous language system options. Similar to the Accent 1400, the Accent 1000 offers multiple access options and accommodates the NuEye® Tracking System and the NuPoint® Head-tracking System. The Accent 800 offers advanced functionality and user-friendly features, making communicating fast and easy. 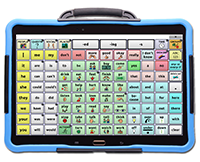 It is the smallest and most portable device that offers a variety of vocabulary options. NuEye. Access full communication and computing power with just your eyes. NuEye from PRC gives users full visual control of the device. Keys are "selected" by gazing for a specified period of time to generate speech. NuPoint. NuPoint® is an effective access solution for users who have limited or no use of their hands. Using optical sensors, NuPoint tracks a small reflective dot on the user’s forehead, glasses or other convenient spot converting the natural movement of the user’s head to accurately control the pointer on the screen. Key activations are made by dwelling over the desired key. PRC offers an extensive line of additional access methods and accessories for your device. 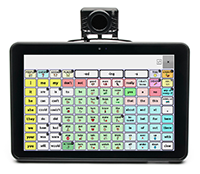 Contact your Augmentative Communication Consultant for more information. The NOVA chat line of devices offers the well-known Chat Software on an Android™ platform. 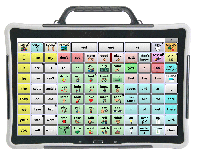 All NOVA chats offer a durable yet sleek portable design, with features that include a clear, bright display, switch scanning, Social Chat, IVONA© speech synthesizer, and many other features. 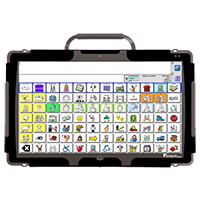 A variety of vocabulary configurations provides options, and each NOVA chat product includes thousands of SymbolStix© symbols, with PCS© symbols available for adding on. The NOVA chat 12 is the largest NOVA Chat yet, offering a robust communication system with the Chat software on an 12.2" Android platform. Weighing only 2.85 lbs., the capacitive touchscreen is accessible by finger touch or an included stylus. The NOVA chat 10 weighs only 2.4 lbs. and is accessible by finger touch, switch scanning or an included stylus. The NOVA chat 8 weighs only 1.3 lbs. and is accessible by finger touch, switch scanning or an included stylus. The NOVA chat 5 is our smallest high-tech communication system and offers the well-known Chat software on a 5" Android platform. The device weighs only .7 lbs. and is accessible by finger touch, switch scanning or an included stylus. Expertly engineered to help people find their voices, tablet technology and Android-based Chat software come together and are exclusively available in two sizes to accommodate a variety of communicator needs. 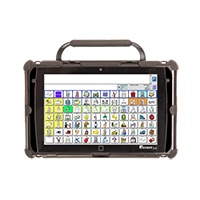 Enjoy comprehensive communication potential through AAC with the industry-leading WordPower™ suite, additional standard vocabularies, expansive SymbolStix® library, and optional PCS symbols. In addition, freedom of access is available for individual capabilities through options like direct selection, single or two-switch scanning, and optional ChatPoint (headpointing). The Chat Fusion 10 is a robust communication device including Chat Point (optional headpointing), a front and rear camera, extended battery life and wireless charging capabilities. Chat Fusion 10 comes with a 10" screen and weighs only 2.4 lbs. and is accessible by finger touch, optional headpointing or an included stylus. The Chat Fusion 8 is a smaller, more compact communication device that has an extended battery life, multiple access methods including Chat Point (optional headpointing), single or dual switch scanning and wireless charging capabilities. Chat Fusion 8 comes with a 8" screen and weighs only 1.9 lbs. and is accessible by finger touch, optional headpointing or an included stylus. Saltillo offers an extensive line of accessories for your device. 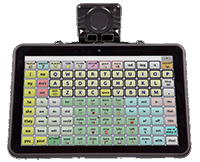 Contact your Augmentative Communication Consultant for more information.